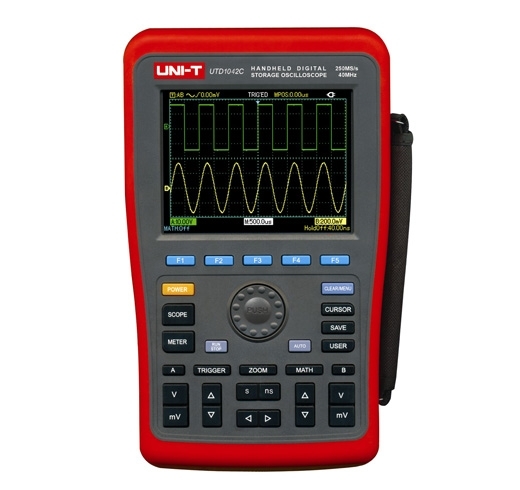 Designed for use out in the field, this oscilloscope is handheld, portable and is a great tool for measuring waveforms on electrical signals. Featuring the ability to accurately track two waveforms simultaneously thanks to dual-input, the UTD1102C displays waveforms over a time period simultaneously, complete with colour coding for easy reference. This oscilloscope has bandwidth of 100MHz, sampling rate of 500MS/s and features multiple trigger types (Edge, Pulse, Video and Alternate). The UTD1102C also features rise time of ≤3.5ns, memory depth of 7.5kpts, vertical sensitivity of 5mV-50V/div, time-based range of 5ns-50s/div and includes setup, waveform and bitmap storage modes. Multiple functions accessible on the tester's button interface allow adjustments and further analysis of waveforms to take place. 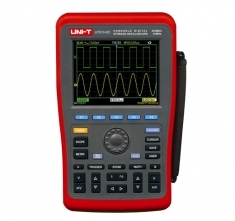 As well as its standard oscilloscope functions the UTD1102C also functions as a full multimeter, negating the need to use a separate tester for electrical measurements. This mode can be used to measure DC voltage to 1000V, AC voltage to 700V, DC current to 6A, AC current to 6A, resistance to 60MΩ and capacitance up to 600μF. The multimeter is autoranging and uses display count of 6000.